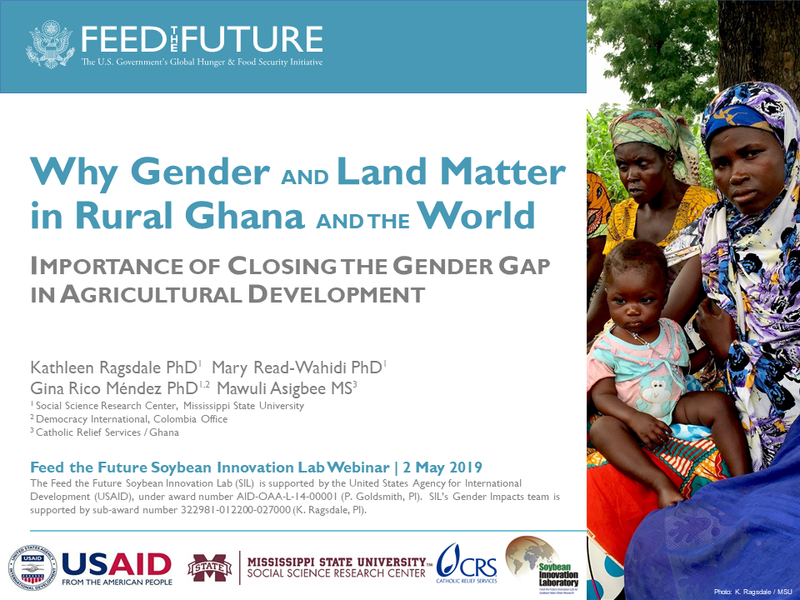 The USAID Feed the Future Innovation Lab for Soybean Value Chain Research (Soybean Innovation Lab, SIL) is hosting a webinar on Thursday, May 2, at 10 a.m. CDT / 3 p.m. GMT entitled, Why Gender & Land Matter in Rural Ghana and the World: The Importance of Closing the Gender Gap in Agricultural Development. Soybean Innovation Lab researchers Kathleen Ragsdale, Mary Read-Wahidi, and Gina Rico Méndez will co-present with implementing partner Mawuli Asigbee on issues related to land tenure, access, and rights. Drawing on their work in Ghana with men and women soybean producers, the panelists will explore with you how to frame research questions to examine land rights issues central to gender responsive agricultural development. Join us on May 2nd!